Super Bowl Sunday is a lot like Thanksgiving. There's a lot of eating and drinking and sitting on the couch watching football. And just like Thanksgiving, there's an opportunity for people to pack on some extra pounds by over-indulging. Charles Platkin, executive director of the New York City Food Policy Center at Hunter College and editor of DietDetective.com, says most people probably have no idea how many calories they're consuming on game day and how much physical effort will be required to burn them off. So, Platkin has come up with a typical Super Bowl party menu and calculated what's required to burn the calories. The results may astound you. For example, a staple of any football gathering is Buffalo crispy chicken wings, typically served with delicious blue cheese dressing. By halftime, you might have downed 10 of them. But the 10 wings have a combined 950 calories, and when dipped in the blue cheese dressing, that surges to 1,400 calories. To burn all those calories, Platkin says you would need to run the length of 149 football fields. Don't have a calculator handy? I'll do the math for you. That's the equivalent of running 8.4 miles. But it wouldn't be a Super Bowl without wings, right? Platkin says just eat fewer of them, and make the wings yourself, first removing the skin and baking them instead of frying. You can also substitute hot sauce with salad dressing. Maybe a footlong meatball sub from Subway is on your Super Bowl menu. Yes, it's tasty, loaded with Provolone cheese and marinara sauce with double meatballs on a hearty Italian roll. If you eat the whole thing, that's 932 calories. To burn them off, Platkin says you'll need to climb stadium steps for a solid one hour, 49 minutes. His suggestion? Go with turkey meatballs, low-fat mozzarella, and a whole-grain hero. Or try Subway's Oven Roasted Chicken sub, which is just 467 calories in the footlong version. There are also a lot of liquid calories consumed during the Big Game. Drinking four Samuel Adams Boston Lagers -- limiting yourself to one per quarter -- is still drinking a total of 720 calories. And that's on top of the calories from the food you eat. Platkin says to burn those calories you'd need to play 68 minutes of professional football, with no breaks between plays or for timeouts. You can always cut your beer consumption to two light beers, which can contain as few as 55 calories each. 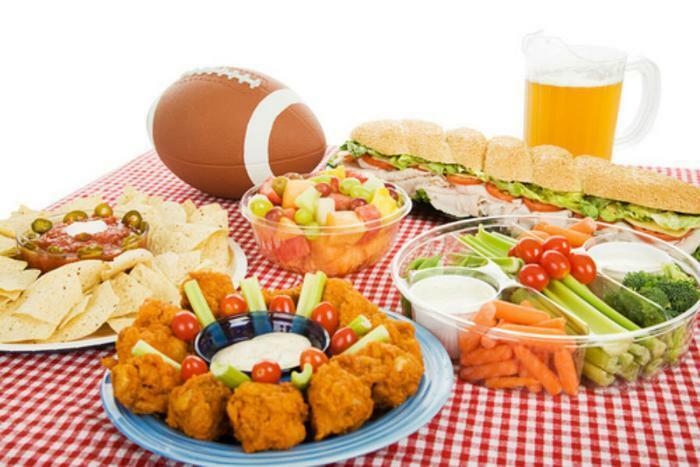 You can learn more about the calorie content of other Super Bowl party favorites here.